This project involved creating a web mapping application to geographically house all construction, operations and maintenance records for Department of Transportation (DOT) jurisdictional natural gas pipelines owned by our client. The locational data collected by the surveyor is combined with inspection documentation materials collected by the project manager into a single database that is accessed using a custom password protected web-based application. The tool may be used by project managers to track progress during construction and as a means of performing Quality Assurance/Quality Control (QA/QC) by ensuring required materials are attached to each locational feature. 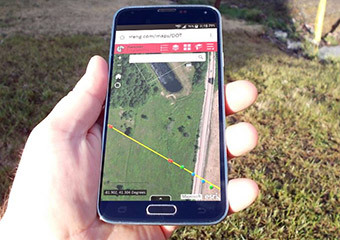 Technicians may use the tool in the field to help navigate to a specific location and record findings using data collector functionalities built for mobile devices. For locations with internet access, the collected data is posted to the map in real-time, allowing decision-makers immediate access to information. Gone are the days of bulky binders on far flung shelves caked in dust and with missing pages. This project exemplifies the “New Media Age” we live in today where any-and-all information with a location component can be mapped and made available on demand in an electronic format.